Senate Democrats want voters to believe they barely know the man. Senate candidates across the country are now training their fire on President Obama , railing about his failed policies and touting their fierce opposition to his agenda. And those are the Democrats. 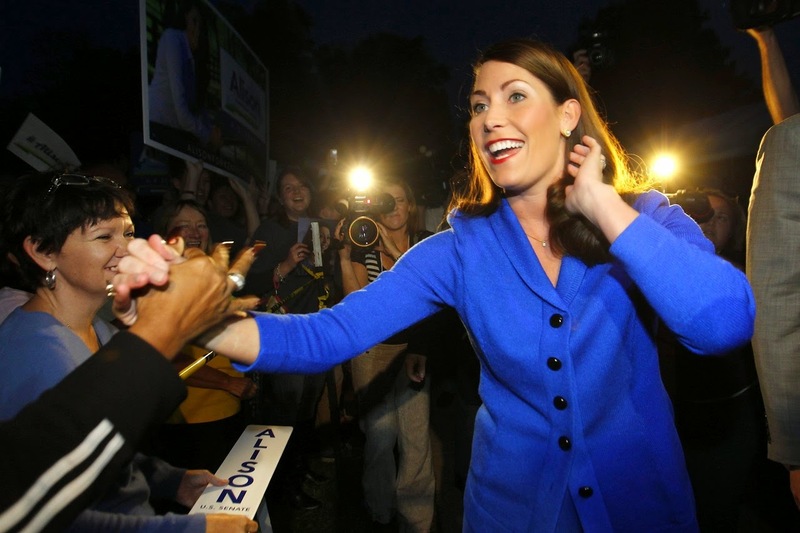 The Obama-denial campaign reached new comic heights last week with Kentucky Senate candidate Alison Lundergan Grimes ’s refusal to say if she had voted for Mr. Obama in 2008 or 2012. The Democrat dodged the question again at a Monday debate, insisting she had a “constitutional right” to keep secret whether she voted for the man for whom she served as a delegate at the 2012 Democratic nominating convention. Voters might fairly conclude Ms. Grimes is less worried about the sanctity of the ballot than she is Mr. Obama’s 31% job approval in Kentucky. Not that this is a new theme for Ms. Grimes, who last month debuted an ad showing her toting a shotgun, declaring she is “no Barack Obama” and explaining she disagrees with the President on “guns, coal and the EPA.” The ad followed one by West Virginia Democratic candidate Natalie Tennant, who in July ran an ad showing her cutting off the electricity to the White House and vowing to “make sure President Obama gets the message” that she supports coal. More amazing have been Senate Democratic incumbents, who want voters to forget their lock-step support of the President for the last six years. Arkansas Sen. Mark Pryor ’s first ad—which ran last year—highlighted his opposition to Mr. Obama’s gun control agenda. “No one from New York or Washington tells me what to do,” Mr. Pryor declared. He’s voted with Mr. Obama 93% of the time. Alaska’s Mark Begich is bragging that he “took on Obama” to fight for oil drilling in his state and has mused that he’d love to drag the President to the Arctic National Wildlife Refuge and “bang him over the head” with the oil subject. He’s gone with the White House 97% of the time. Louisiana’s Mary Landrieu boasts in an ad that she helped end the Administration’s 2010 moratorium on drilling for oil in the Gulf of Mexico, and in another TV spot claims personal victory in forcing Mr. Obama to let people “keep their health care plans.” People still can’t keep their health plans, and as chair of the energy committee Mrs. Landrieu has passed nothing of note. But the prize for best non-denial denial might go to Colorado’s Mark Udall, who declared at a recent debate: “Let me tell you, the White House when they look down the front lawn the last person they want to see coming is me.” No doubt Coloradans would love to have seen Mr. Udall stride down that lawn when it mattered. Despite claiming to support fossil-fuel jobs, Mr. Udall has remained a loyal Obama vote against the Keystone XL pipeline. Had any one of these Democrats opposed ObamaCare, if only to force improvements, the law would not have passed the Senate without changes that might have made it far less destructive. Mrs. Landrieu famously traded her vote for $300 million extra in Medicaid funds, known at the time as the Louisiana Purchase. Every Democratic incumbent also voted for Mr. Obama’s stimulus, and they all supported the Dodd-Frank law that has enshrined too-big-to-fail for large banks. They also lined up behind Majority Leader Harry Reid ’s gutting of the 60-vote rule for presidential nominations. That vote helped Mr. Obama pack the D.C. Circuit Court of Appeals with three liberals who will make it harder to challenge Mr. Obama’s rule-by regulation on oil and gas that these Democrats claim to oppose. They’ve also been loyal servants of Mr. Reid’s strategy to close off nearly all Senate debate and amendments. This has undermined the ability of these Senators to challenge the White House by forming bipartisan coalitions. By making the Senate less open to debate than the House, they abandoned any leverage to act as the independent actors they now claim to be. Mrs. Landrieu and Mr. Begich, both from oil and gas producing states, were unable this year to get a floor vote to approve the Keystone XL pipeline, or even more rapid approval of natural-gas exports that might counter Vladimir Putin ’s energy squeeze on our European allies. They effectively neutered themselves. Yet they now want voters to believe that if they get another six-year term they will somehow emerge as giants of principled independence. That promise will turn into a pumpkin the minute they again cast a vote to make Mr. Reid Majority Leader. The deny-Obama strategy may be a political necessity in the sixth year of this listing Presidency, but voters who fall for the ruse will get a continuation of the same failed policies.